There's two kinds of people when it comes to your home's security system and ADT Specials. There's those that pay the first price they see. Then there's those that love yard sales, they've haggled over the price of a $1 sombrero in some tiny tourist town south of the border or those that merely watched a TV show where someone argued with a guy named John until John paid him to take a 1971 RV off his hands. We figure you are the second person. Mainly because you are reading this post. We get your need for a quality product at a price that will make you burst into song. Welcome to GREAT value central. As a consumer, you expect and demand that... right? And immediately even! No Tijuana style street-haggling, it's the best deal, better than the competition or you're on to the next provider... you know, one of the other 300 ADT dealers or some little guy down the street. This ADT special better be special, right? Am I speaking your language here? Of course I am... I'm a consumer too. 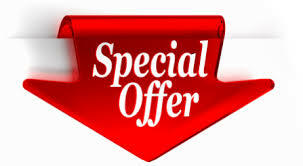 Did you know California Security Pro offers a price match policy? We do! We are determined to win your business and won't let a couple bucks get in the way. Not only will we knock your socks off with great customer service, we'll save you from having to go with the other guy by making sure that our prices are never a hurdle! 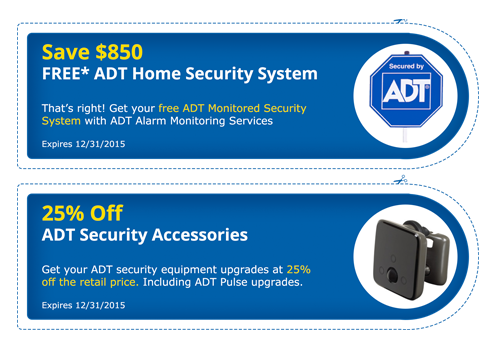 Get value with ADT Pulse Pricing and Special Offers. 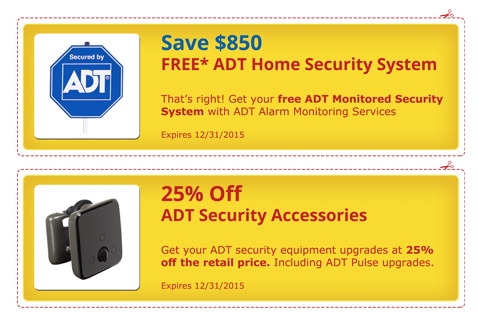 So you've decided on an ADT Pulse home security system for your home or place of business. That's a smart decision! As one of our customers, you'll receive an amazing value and protect what matters most - your home and family. Don't forget we also offer a price match policy, We'll match any price on a comparable system and installation. With these specials, who could resist the security system you've had your eye on? After looking at the competition, you've probably already realized that ADT is the way to go and a special discount offer will assure you get the most bang for your buck. For some, the cutting edge technology of ADT Pulse has you hooked and although pricing is already great, the ADT Pulse cost with a discount makes it a flat out amazing value. Then there's some that respect ADT Security as one of the country's most remarkable and deep-rooted business stories. From humble beginnings delivering telegraphs by foot to now keeping a watchful eye on a business thousands of miles away, their business plan started with a husband's love. A woman wakes to an intruder in their bedroom so the ever protecting husband, who happens to runs the local telegraph business, responds by creating the first home security system. Now that's irresistible! Over a century later, ADT still leads the way in security and over 6 million families and businesses rely on ADT's protection every day. 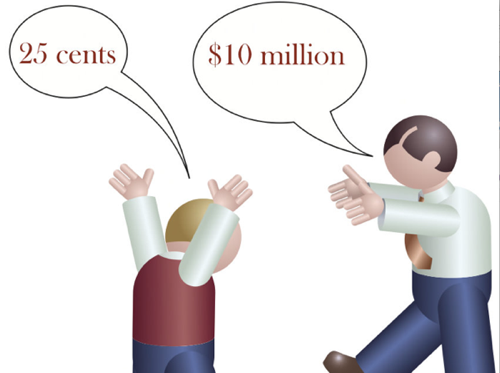 As romantic of an American success story as that is, your savvy side still demands the absolute most for your hard earned cash and we've got you covered! Using ADT coupons and ADT specials can help trim the costs on your new security system. 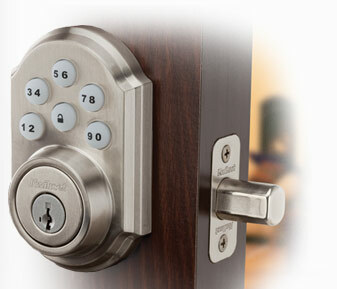 Whether you are protecting your home or business, value is a must. As you do your research and weigh your options, one choice that you shouldn't have to make is having the best home security system for your family or saving a few dollars. California Security Pro is the premier Authorized ADT Dealer in California and we'll help you save money so you don't have to settle for second best! California Security Pro offers a FREE home security review along with FREE security equipment valued at $850 when you get monitoring service with ADT. ADT is the #1 home security alarm monitoring company in America. Already prewired or have existing security equipment? No problem because you will still receive $850 of FREE upgrades to your existing DSC, GE and Honeywell/Ademco manufactured products. Go with the best without paying more than you should!